Benitachell is a very small Spanish town located on the Northern Costa Blanca in Spain. All visitors on their way to Javea from Alicante Airport pass through the town of Benitachell before spending a day at the beach or on the way to the accommodation which they have booked. Benitachell is also the gateway for tourists and visitors who are making their way from Javea to the sea side resort of Moraira. Benitachell has become a popular place for expats to reside as it is so close to Javea and has all the amenities required for a quiet life. Purchasing or renting a villa or apartment is also a lot more affordable in Benitachell than it is in neighbouring Moraira or Javea on both a long-term and short term basis. Benitachell and the urbanisation of Cumbre del Sol is also the home of one of the Northern Costa Blanca’s most popular primary schools specialising in the English curriculum, the Lady Elizabeth School. Cumbre del Sol has some of the most spectacular views of the Mediterranean towards Moraira and Calpe as well as towards the resort of Denia to the south. Cumbre del Sol is a popular urbanisation along with the Pueblo Alcazar, Les Fonts, La Joya and Los Callistros. Cumbre del Sol is a large urbanisation and stands out on its own with a good selection of bars, restaurants, shops as well as villa to rent on both a long or short term basis. Benitachell has a very limited range of hotel rooms to book and the only establishment which has rooms to rent by the night is the Tres Arcos with rates starting at €52. The neighbouring resorts Javea and Moraira have a few more possibilities when it comes to renting a hotel room. Benitachell’s closest beaches are the El Moraig Beach and the coves of Los Tiestos and El Llebeig as well as the blue flag beaches of Javea and Moraira while the nearest golf courses include the Javea Golf Club, San Jaime Golf Course in Benissa and the La Sella Golf Course in La Sella near Denia. There are even stables to enjoy horse riding while on holiday to Benitachell. Benitachell has more than its fair share of popular restaurants which includes Monroe great for Sunday lunches as well as La Palette, Country Life, Restaurante La Cumbre, Tasca Les Fonts, Three Arches, Casa de BenisAsia and Monte Video. Most British visitors to Benitachell spend their evenings enjoying the nightlife of Moraira and Javea or even travel further afield to the ever popular tourist resort of Benidorm, the number one nightlife destination on the Costa Blanca. Benidorm is also great to visit in the day especially if you are keen on water parks or roller coaster fun. Benitachell is a great place to live or spend a holiday as it is near enough to major tourist resorts but also quiet enough to get away from it all. Whether you’re looking for a place to rent or to stay at permanently, you can take advantage of the services from the real estate agents in Benitachell who are more than willing to help you in finding your ideal residence. You can contact Martin & Price International Real Estate (www.martinandprice.com, Tel. +34 625 14 88 95 and +34 96 618 2721); Benitachell Properties SL (www.benitachellproperties.com, Tel. +34 966 493 572) and Salco La Cumbre (salcolacumbre.com, Tel. +34 966 493 404). Opening Hours: Monday to Friday, from 09:00 to 15:00 h.
Ana, what would you say would be the advantages to living in Benitachell compared to other Costa Blanca towns? It is a peaceful and quiet place even in the summer months. No downsides. It is an ideal place for everybody. However, to be able to fully enjoy the area, having a car is recommended. About 30% are Spanish, the rest are mostly from the European Union and mainly British. It is a perfect place to enjoy the outdoors with hiking trails, horse riding, golf courses and beautiful areas for sailing, snorkling or diving. I will recomend the Restaurant La Cumbre, in Cumbre del Sol urbanization. Trillaora is a local Café-Bar in the village. 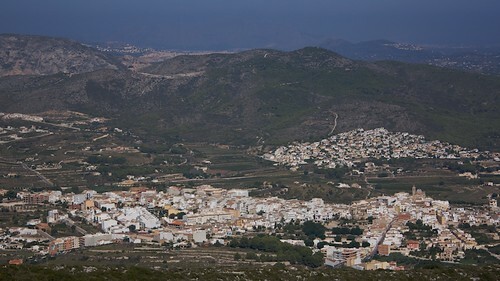 In the surrounding areas of Benitachell are plenty of bars and restaurants, just 10 minutes drive to Jávea or Moraira. Yes, facilities are nearby, supermarkets, doctors, dentists, shops, schools, everything within 10-15 minutes drive. Not smaller than Benitachell but besides Jávea or Moraira, the towns of Calpe or Altea are just 20-30 minutes drive. Alicante city is just one hour drive and Valencia less than one and a half hours drive. In La Cumbre del Sol, it is the international school Lady Elizabeth, ranked in El Mundo (one of the most important Spanish newspapers) as one of the best in the country (http://en.laudeladyelizabeth.com/). The crime rate in Benitachell is very low compared to the national average. Besides there are also neighbors initiatives like Neighborhood Watch in Cumbre del Sol, which I’m part of, very effective in preventing crime and reporting it to the local police, very helpful for expats that do not speak Spanish. It seems like prices tend to stabilize and no longer fall further. Clearly the best time for buyers. It is the best time to buy a property. Repossessions were few in the area and the best deals from the banks are gone. Today there are very good properties for very good prices in the market and still bargains for sell. In a market with a great offer of properties, it takes an expert eye that knows the area and the market situation to separate the wheat from the chaff, that’s why it is important to get advised by a professional. How much are the typical property prices in Benitachell for apartments, villas etc? There is a wide range of different properties and different prices, from the nice two bedroom apartments for less than 100,000 euros to luxury apartments over 400,000 euros. The same for houses with prices around 150,000-250,000 euros to bigger luxury villas with prices over a million and more. Any tips and advice to people looking to buy in Benitachell or surrounding area? Choose an agent you like and take some advice. It will save you time and money. Ana, thank you so much for taking the time to help our readers with your experiences in Spain. If you want to contact her, you can find her details below. Below is a video showing some of Benitachell’s most notable places.